...That's a lot of apples. So that brings us to our next obvious question: what's a girl to do with all those apples? 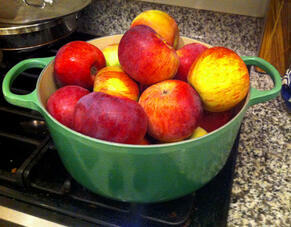 While I'd love to say the answer is to bake 15 pies, there's a better solution: apple butter! 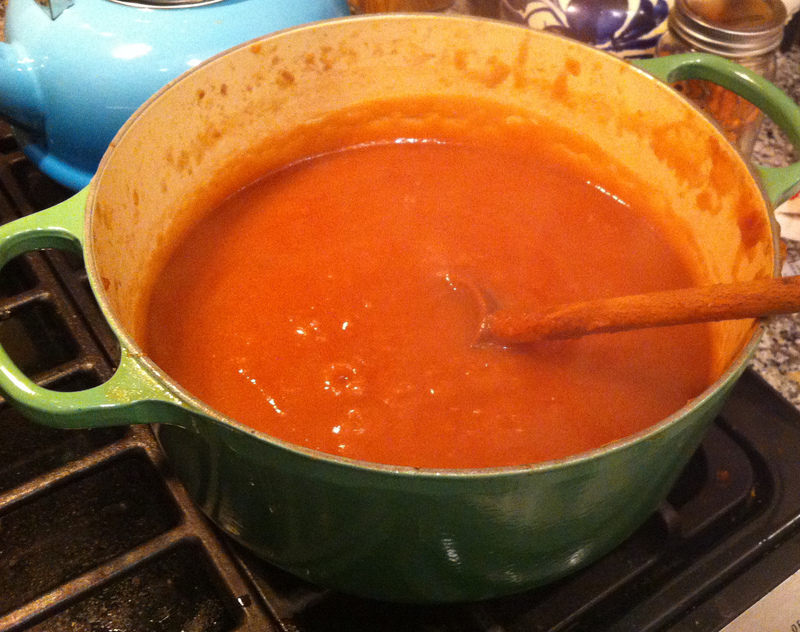 I'd made my first batch of apple butter two years ago and was surprised at how easy it was to prepare. 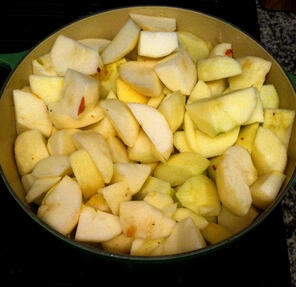 Cut up apples, put in Crockpot, throw in minimal seasoning, and let cook. 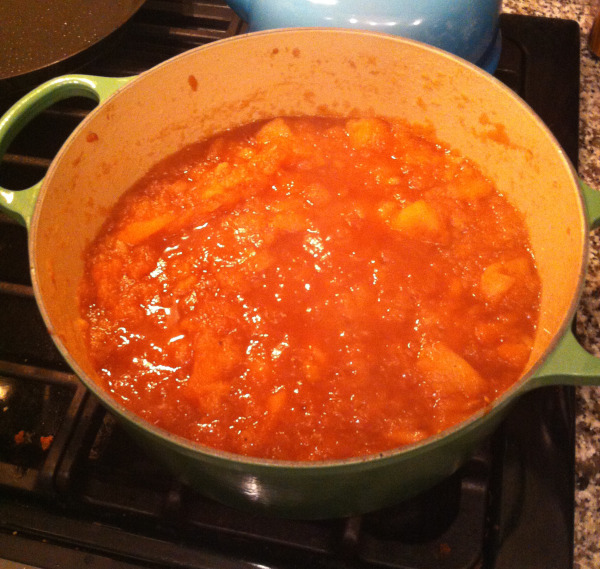 Four hours later, voilà: apple butter! I'd overcooked my original batch a bit so it had a more caramelized flavor than I think is typical, but the apple butter was so delicious I'd been looking forward to making another batch ever since. Contrary to what the name implies, there's actually no butter in apple butter. In fact, the it's more like super-concentrated apple sauce: the name "apple butter" comes from its creamy, thick, and spreadable consistency--kind of like very soft butter. Because it has a high concentration of natural sugars, apple butter also has a long shelf life. Case in point: I have a jar in the fridge from two years ago that was opened 6-7 months ago and is still alive, kicking, and delicious. Enough chitchat, on to the recipe! 2. Add to pot and place over medium heat. 3. 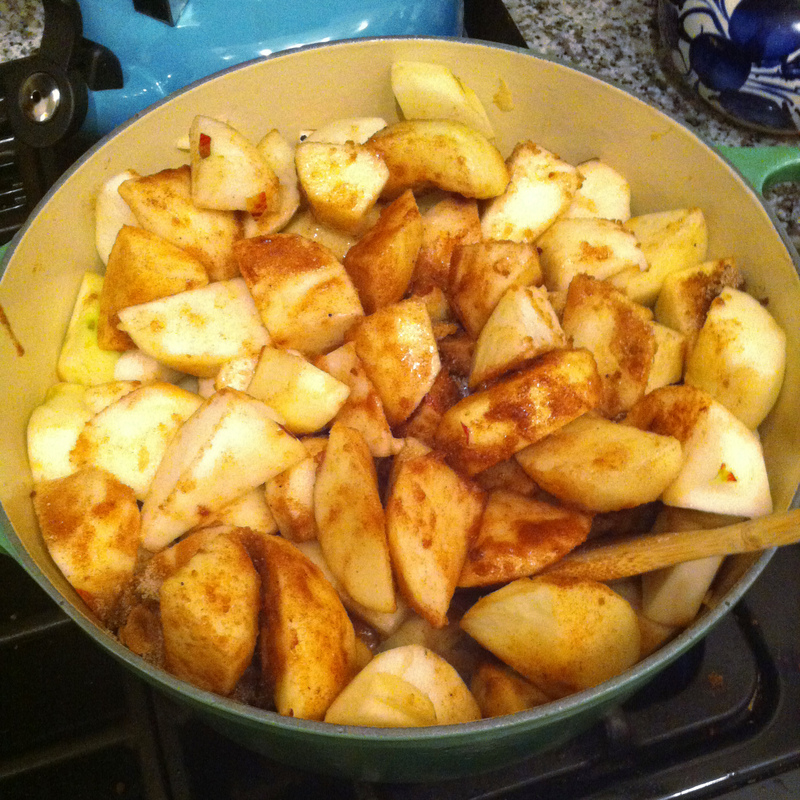 Mix sugars, spices, and salt in a bowl, then add to apples. Stir well and allow apple mixture to come to a low boil. 4. Add cinnamon stick, then cover the pot and let the apples cook down until they're almost all broken up (this takes about an hour and a half over low to medium heat). 5. 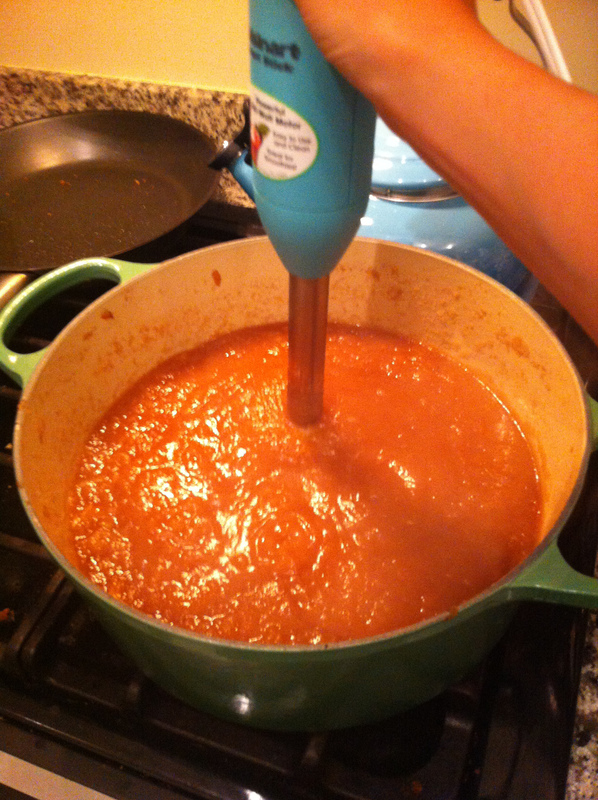 Use an immersion blender to puree apples until smooth. 6. Let simmer for an additional 30-40 minutes, or until you reach a desired color--the darker the butter, the more caramelized the apples. 7. Can the butter or just eat it out of the pot! The sweetness of your apples will depend on how much sugar you will need to add--in retrospect, I would probably add more sugar to my butter as the Cortland apples turned out to be fairly tart. Your apples will cook down A LOT: expect the volume of apple butter you get to be about 1/2 that of the apples you start with. You could easily make this recipe in a Crockpot; I was just looking for a quicker solution so made it on the stovetop. For the Crockpot, just let it cook for 4-5 hours on high or 8-10 hours on low before pureeing with the immersion mixer.